If you have a nuisance raccoon on your property, The Critter Team provides professional raccoon removal, raccoon control and raccoon trapping services in Crosby Texas and the greater Houston area. The Critter Team is a licensed and insured wildlife management company specializing in nuisance wildlife removal services, including raccoons, squirrels, snakes, skunks, moles, bats, opossums, armadillos and birds. We also decontaminate and repair residential, commercial and industrial buildings that have been damaged by wild animals. Call The Critter Team today at 281-667-0171 to speak with a raccoon management expert. The Crosby TX area has more than its share of raccoons. Raccoons have a habit of making themselves at home in urban and suburban areas. They should be living in hollow stumps and other natural cavities, but it’s a lot less hassle to live in your attic and dig through your garbage cans. Your attic, garage, basement, shed or storage facility is rent free and more comfortable than a tree stump. The thing is, raccoons destroy building materials, contaminate insulation with mold producing feces and urine and spread disease. The Critter Team has cleaned up some pretty awful raccoon messes over the years.Critter Team wildlife removal specialists have the professional experience to provide expert raccoon trapping, raccoon removal, raccoon control and raccoon exclusion services in Crosby Texas. Call The Critter Team if you have a raccoon living in your crawl space, attic or under your porch. A mischievous raccoon has an uncanny ability to slip through small openings and structural defects to enter homes and commercial facilities. Then they do what comes naturally: contaminating building surfaces, chewing up wires and dragging in nesting materials. The lethal combination of exposed electrical wires and nesting materials is a substantial fire hazard. Call The Critter Team if you have a raccoon problem. A professionally trained wild animal removal specialist will trap and relocate the intruder, decontaminate and repair building materials and professionally seal your home or business to ensure that raccoons never enter the building again. The Critter Team has obtained a Texas Nuisance Wildlife Removal Permit. We have been authorized to remove and relocate nuisance wild animals, including legally protected wildlife species. Raccoons have a grizzled appearance and are shaded dark to pale gray. Their head, hips and feet are often tinted red. The stomach and tail of the raccoon are usually white to pale gray. The coloring and markings of male and female raccoons are similar, but the males are somewhat larger than the females. Mama raccoons produce two litters of two or three baby raccoons a year, so it’s a good idea to get those raccoons out of your attic before things really get out of hand.The Critter Team receives complaints about Crosby Texas raccoons digging through garbage cans, entering homes or businesses and digging up landscaping to search for food. Never approach a wild animal. Raccoons carry a number of communicable diseases, and they will bite. Call The Critter Team if you suspect that you have a raccoon on your property. Raccoons will damage your electrical wiring, HVAC ducts, and attic insulation. The Critter Team provides raccoon removal, raccoon control and raccoon trapping services in Baytown, Bellaire, Bunker Hill Village, Deer Park, El Lago, Galena Park, Hedwig Village, Hilshire Village, Houston, Humble, Hunters Creek Village, Jacinto City, Jersey Village, Katy, La Porte, Nassau Bay, Pasadena, Piney Point Village, Seabrook, Shore Acres, South Houston, Southside Place, Spring Valley, Taylor Lake Village, Tomball, Webster, and West University Place. Call The Critter Team today at 281-667-0171 to have a Crosby Texas raccoon or other nuisance wild animal safely removed from your home or business. 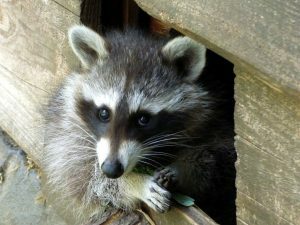 We specialize in raccoon trapping, raccoon removal, raccoon in attic and raccoon control. The Critter Team is a veteran owned business that offers humane nuisance wildlife removal services, affordable prices and unrivaled customer service.